Did you see us at the Feather and Fowl auction at Murton on Saturday? No, well that’s probably because regardless of the big intentions we had to be there, the three male Muscovy ducks we intended on taking had other ideas. I thought things were all planned meticulously, with both Wendy and I ready for action, gloves on (they have big claws), a new cage bought, tempting grub on hand and a confined space sorted. After countless attempts on both Friday and Saturday to pin them down, with the barn looking like a bomb site, we eventually gave up until next month. In the meantime we will be borrowing our son’s large fishing net, which we think is the missing link between us and certain success. After introducing our Pygmy goats to Long Meadow Farm last year, I spent far too long on sourcing a couple of toys to entertain them in their enclosure. After several attempts to restrict their movements, with their fencing becoming more and more Alcatraz-like we felt that a couple of large toys or alike would help to keep them occupied. Firstly, I snaffled a large tractor tyre which they love to jump on and off of as well as using it as a sun lounger. I then decided, in my wisdom, to build a set of steps which is like a small bridge. I probably got the idea from reading about the Three Billy Goats Gruff, trip-trapping over the troll’s bridge, all those years ago. Anyway, it appears that it was a big mistake making these steps. In reality things had been quiet for months with the goats. They really weren’t causing us much grief at all and had settled down fine, or so we thought. Little did we know, they had other ideas. So, picture the scene, there I was just minding my own business, watching some finches on the feeders and I caught a flash of black and white out of the corner of my eye. I did a double take and as I looked over a second time I saw ‘Nessa’, one of our Pygmy goats running around the farmyard causing havoc and disturbing the peace. I shouted Wendy to grab her shoes, I ran over to the scene of the disturbance and Wendy immediately ran over to shut the main gate at the front of the farm. We had Nessa contained and very quickly we were able to usher her back to where she should be. It was only then after surveying the scene we established how this breakout had occurred. The set of steps which had so lovingly been built for their entertainment had been pushed from the middle of their pen all the way over to beside the fence at the front. Nessa had then only to trip-trap her way up the steps to the top and jump over the 4ft fence to freedom. We are still uncertain as to wether it was a one goat job or they had all assisted in the escape attempt, but their escape effort was foiled before the remaining two had managed to make their own breaks for freedom. As you would expect, I moved the steps across to the far side of the enclosure so they couldn’t try again but that was clearly never going to be good enough. Nessa, managed to escape, via the same route, less than 48 hours later. 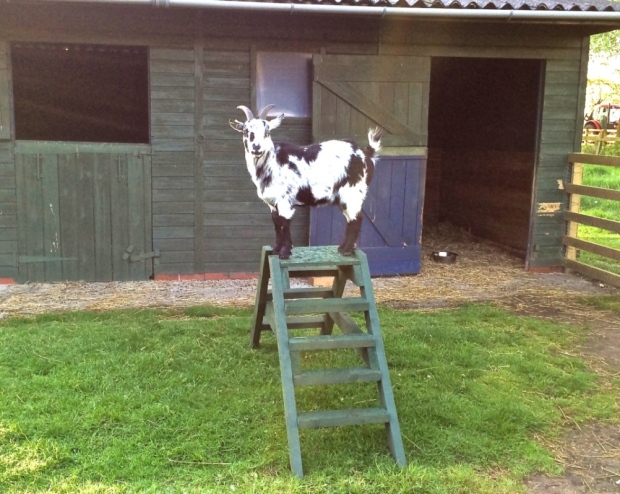 Needless to say, the steps are now no longer available to the goats until I chain the results of my handiwork to the stable to ensure that they aren’t used to aid any more breakout attempts.